Bus from Sungai Petani to Ipoh is one of the popular options of transportation for the locals to travel from Sungai Petani to Ipoh. The main reason is because there is no direct flight service and frequent train schedule available for this route. Therefore, direct bus service become the primary mode of transportation for passengers to travel between Sungai Petani and Ipoh. Sri Maju and Cepat Express are the only two active bus operators operating bus from Sungai Petani to Ipoh. Sri Maju Express has 5 daily departures while Cepat Express provides 4 daily departures. Sri Maju coach fleet are all VIP bus with comfortable seating. Cepat Express deploys both VIP coach and standard 40-seater coach in this bus route. The earliest departure goes in the morning 10:30am, while the latest departure goes at night 10:30pm. 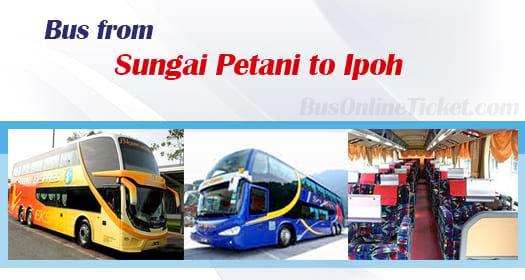 Bus from Sungai Petani to Ipoh takes about 3 hours, depending on the traffic condition. Washroom break will be given upon request to the bus driver during short-distance bus journey. The ticket price for bus from Sungai Petani to Ipoh is either RM 18.60 or RM 26.00, depending on your selection of bus operator. Cepat Express is also offering child price for this route at RM 14.00. For the bus from Sungai Petani to Ipoh, passengers could board the bus from Sungai Petani Bus Terminal. Upon reaching Ipoh, the bus will drop off passengers at Amanjaya Bus Terminal. For your information, Amanjaya Bus Terminal is located quite far from Ipoh city centre. Therefore, in order to get to Ipoh city centre, passengers can take a 30 minutes taxi ride or city bus from Amanjaya Bus Terminal. Passengers are advised to book their bus tickets online through BusOnlineTicket.com especially during school holidays or peak seasons. Our online ticketing portal is available 24/7 to allow our customer to book their ticket at any time, anywhere and any place. You can book your bus ticket online now from our official website BusOnlineTicket.com or via mobile app which can be downloaded for free on App Store or Google Play.